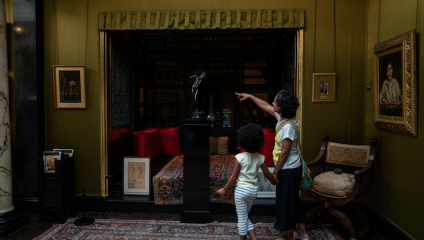 Take a trip down memory lane and bring your family to experience two of the most charismatic Victorian artists’ houses in the heart of Kensington. Leighton House Museum is the studio-house of Frederic, Lord Leighton, eminent painter and sculptor and President of the Royal Academy. His ‘private palace of art’ houses one of the greatest displays of Islamic Tiles, historic rooms with silk wallpapers and stuffed peacocks and a beautiful art collection by Leighton himself and his contemporaries. Our monthly Family Fun programme presents an array of activities for children aged 4 upwards, ranging from storytelling, concerts to arts & crafts workshops and special events during Christmas and Summer. Don’t miss our recently launched Scavenger Hunt Trail, the first of a series of fun and interactive trails helping you discover Leighton, his house and garden. Ask for a pack in reception! 18 Stafford Terrace is the ‘House Beautiful’ of Victorian illustrator Linley Sambourne and his family. Its eclectic interiors remain practically intact and there is the chance to explore and learn more about this extravagant household by joining our Family Costumed Tours during half-term, led by Mrs Sambourne herself or her maid, Ms Reffle.